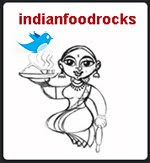 Indian Food Rocks: I did it! I've been meaning to tell you...I donated my hair last week to Locks of Love. I feel so much lighter! It's spring break and we're on the California Zephyr as you read this. I hope I get better pictures this time! Love and hugs to you Manisha! This reminded me of a girl one year my junior in St. Anne's, she grew up with girls constantly staring and giggling at her shinny head. She might have gone thru so much trauma. I do not remember her name and don't know what might have happened to her. LOL, I've to carry on with this marriage for more than a year no? ;)Kidding! I look fat with short hair :( So! Good for you Manisha. My daughter is growing her hair to donate to locks of love. Mine has been treated and they don't accept that, so I can't. Hope your spring break is wonderful. I donated last year, and think my hair is long enough to it again this year. Nice, easy to manage hair for the summer months! Great! 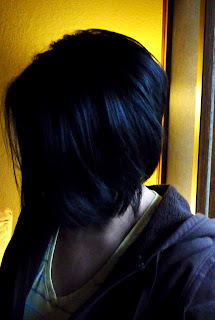 I remember your silky beautiful hair :) Hugs to you! Great cause and fabulous hair cut! Oh the gorgeous hair! Well done - the donated locks and the fab new hair cut! Oh! How wonderful to do this, Manisha. Reading over on Facebook, didn't realize you had a 'cause' in mind. Think Bri did this too, a few years before her breast cancer saga. Her hair grew so fast, thick, and long it always amazed me. Mine never would grow much past my shoulders, so I gave up and keep it short now. Hurray for you and locks of love. My daughter (8 yrs) was going to do that last year and then couldn't. Your hair looks great! Just watching the news about the blizzard at Colorado. I hope you guys are ok! Take care. Well I have to say that the cut is totally hip and definitely in. A worthy cause.. u have motivated me to do the same, though my hair is not as beautiful as urs, but if it helps, I will! Thank u for the information. Just bumped into your blog from another blog. Love the photos of your blog.